One of my personal challenges is to teach using only free, open source classroom tools. I love science texts, but I don’t love the cost. I would much rather have more lab supplies and training. I am so thankful to our school for investing in training as opposed to books. With this in mind I want to share an example of how I am using “open source” science resources in my Biology Class. We just finished a unit on DNA:The code for life. I really like teaching genetics and unraveling the mystery of life. I am using Google Classroom to link students to all of my classroom resources. 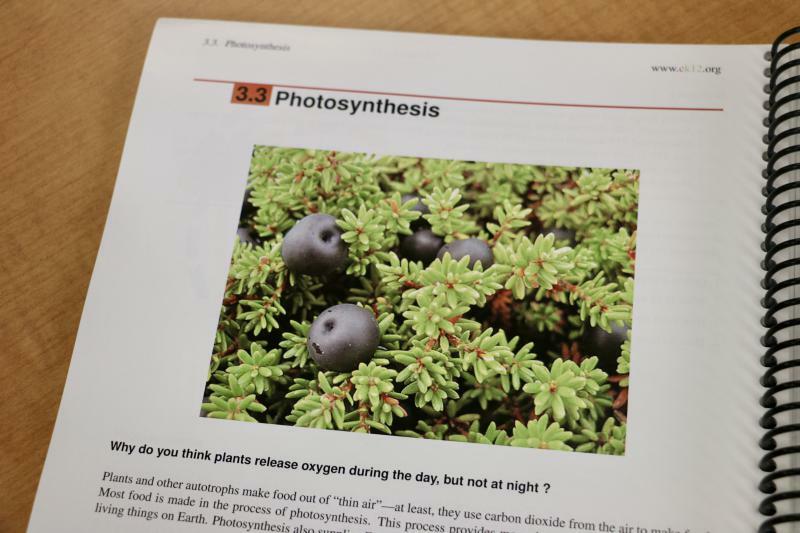 We use our Ck12.org text book for background information. Ck12.org books are great. They are up to date, interesting, easy to read, and accurate. They are as good as any text on the market. We use our book as an informational text. I present the content as an interactive lectures using Nearpod. I use the book as an outline and the students take notes in sketch note style as we explore the material. Students then complete the Adaptive Practice and Quizzes on Ck12.org. All of these resources can be linked to in Google Classroom. The Adaptive Practice and Quizzes are self grading and give students immediate feedback and scores are recorded in Google Classroom. There are interactive PLIX to reinforce ideas through manipulatives with challenge questions. All of these tools are free and customizable. I also want to thank the Biology Corner for supplying us with the DNA and Transcription and Translation coloring worksheets. This website has some of the best free Biology activities on the web. I teach the students about protein synthesis by completing the Investigations, Proteins and Mutations worksheet. Then we apply this to the DNA in Snorks lesson. It’s such a great way of making connections between DNA and proteins that produce traits. As an evaluation of our learning, we complete an Argument Driven Inquiry(ADI) Lab 15: Mutation in Genes from ADI’s Life Science Book. ADI is transforming my teaching. It’s the first instructional model I have used that truly supports my growth in facilitating inquiry learning as opposed to concept based text book approaches. I remember struggling with the 5 E model, when I was first introduced to it. I could understand the parts and the approach, but I couldn’t see how I was supposed to facilitate it. The 8 stages of ADI give me the framework for teaching any lab through inquiry. The student lab handouts are available free online at NSTA Extra’s. This lab asks students to study mutations using the Protein Synthesis model from another one of my favorite sources for open source web based models. the Concord Consortium. 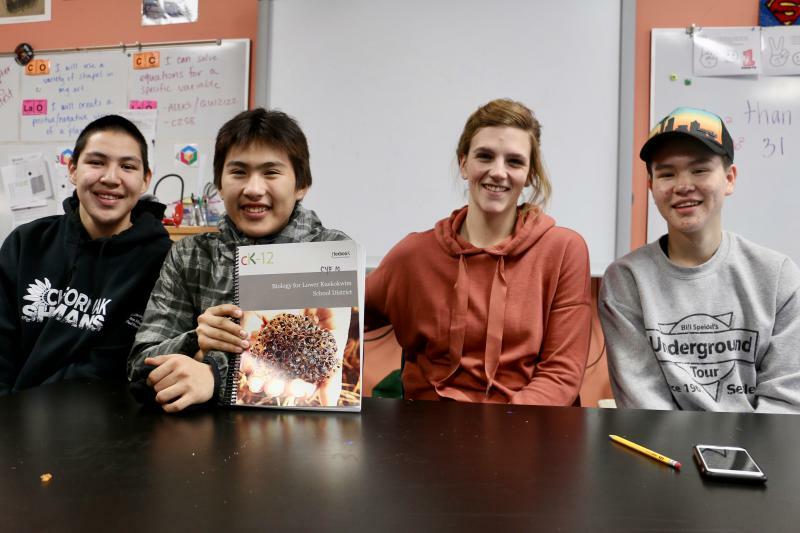 This model allows students to work through the steps of DNA transcription and translation. They can edit the DNA code and visualize the effect of different kinds of mutations. 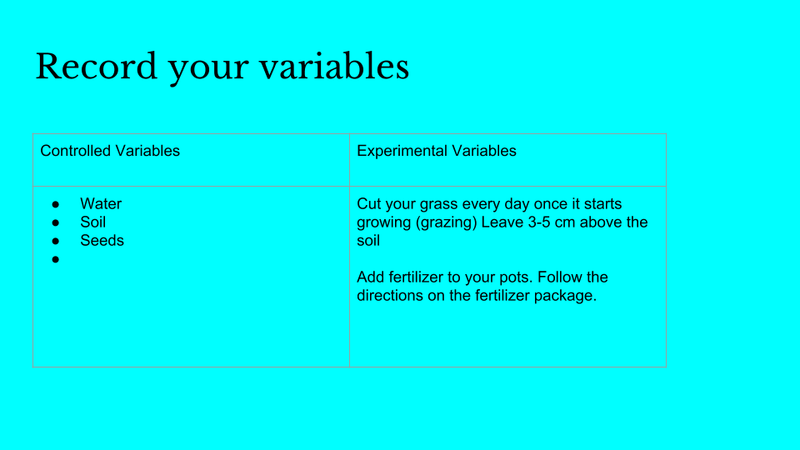 I have embedded an example of how I introduce this lab using Nearpod below. 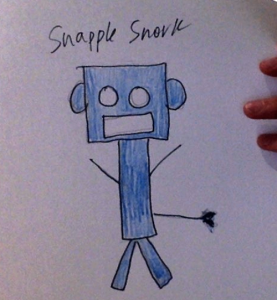 If the code to this Nearpod expires before you stumble upon it. email me and I will renew it. 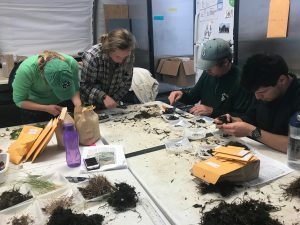 My work team includes an outreach educator from the University of Colorado, a kindergarten teacher from Falmouth, MA, and about a dozen graduate students from Norte Dame and the University of California – San Luis Obispo. We had a camp orientation the night before to learn the in and outs of camp life. I am impressed with the organization and creature comforts. The food is fantastic. I wasn’t expecting 8 flavors of homemade ice cream in a remote tundra camp. 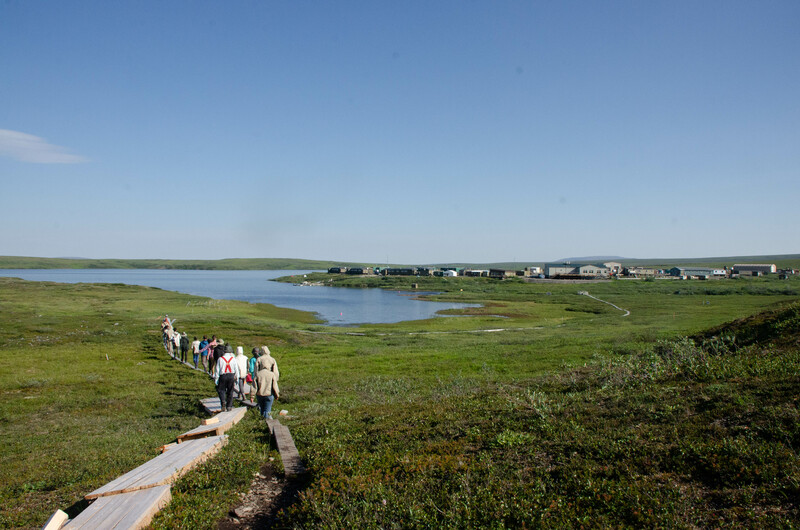 Our day started with a walking tour and overview of the history of Toolik Lake Field Station. There is an impressive board walk that connects the research plots across the tundra. 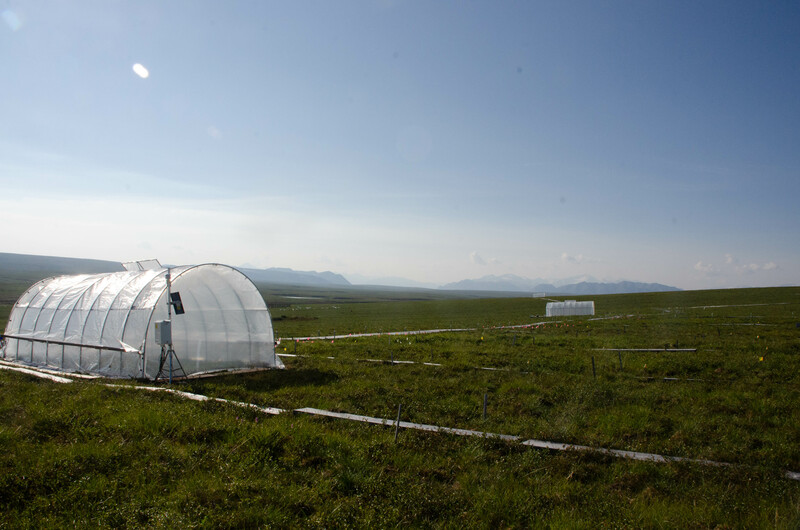 Our first stop was one of the first projects to build artificial warming chambers to study the affect of warmer temperatures on arctic vegetation and soil ecosystems. The first chambers where established in 1986. You can see a dramatic difference in height and composition of plants inside the greenhouses. There are enclosures that test a variety of variables including increased nitrogen and phosphorous production that occurs when bacteria increase their growth in warmer soils and longer growing seasons. Our first project is called a PLUK study. We will be sorting plant samples from an area burned in a tundra fire in 2008. 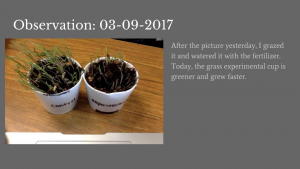 Researchers are studying how composition and speed in which the plants grow back after such a disturbance. The fire was started by a lightening strike. 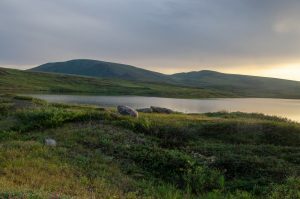 Thunderstorms are uncommon in the arctic, but their frequency is increasing as the average temperature increases. We spent time reviewing how the samples where collected. It was a hot day. 70 degrees in the tundra seems like 90 elsewhere. 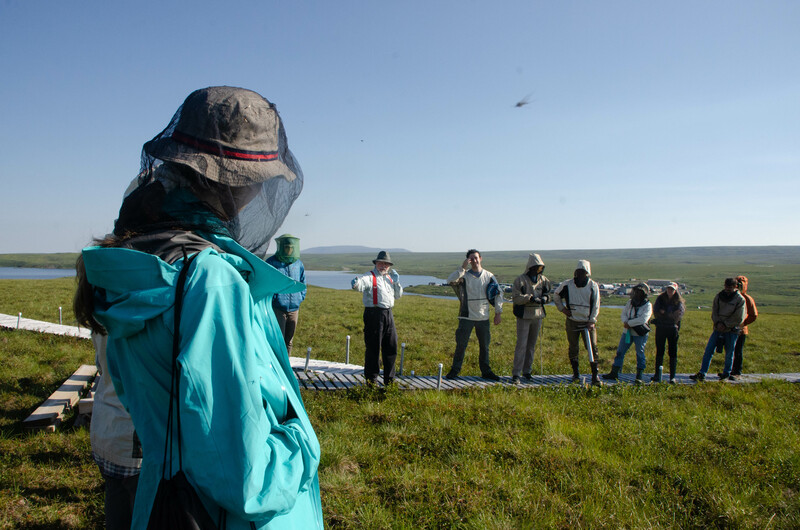 It was a relief to escape the heat and mosquitos to help with samples collected before we arrived. 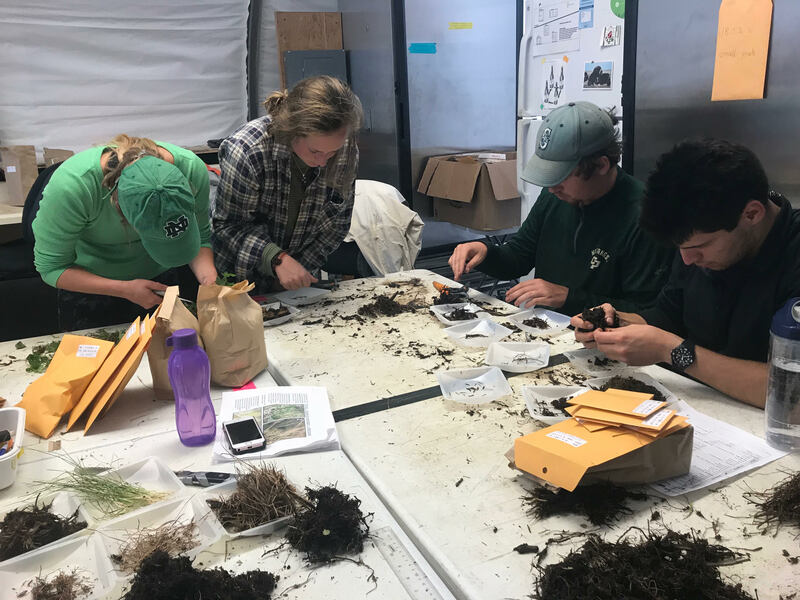 Fifteen of us squeezed into a lab tent to learn how to sort and label samples, working in groups of three. We started at 11 am and finished our sample at 8 pm. There was a break for a wonderful dinner of seafood scampi and more ice cream. I may brave the mosquitos to take some evening photos. 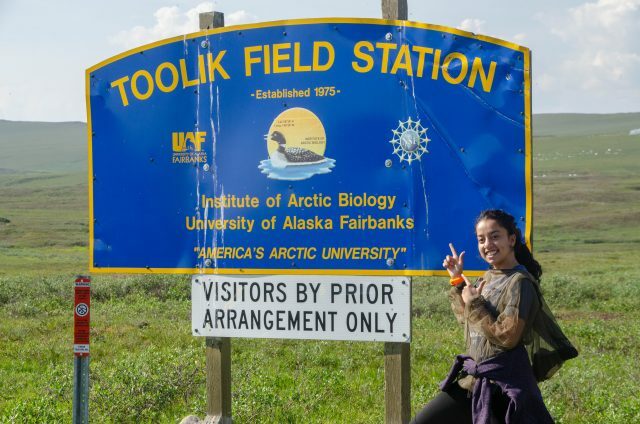 This summer I was invited to join researchers as at the Toolik Lake Research Station. Each year researchers invite educators to work on their Long Term Ecological Research (LTER) projects. 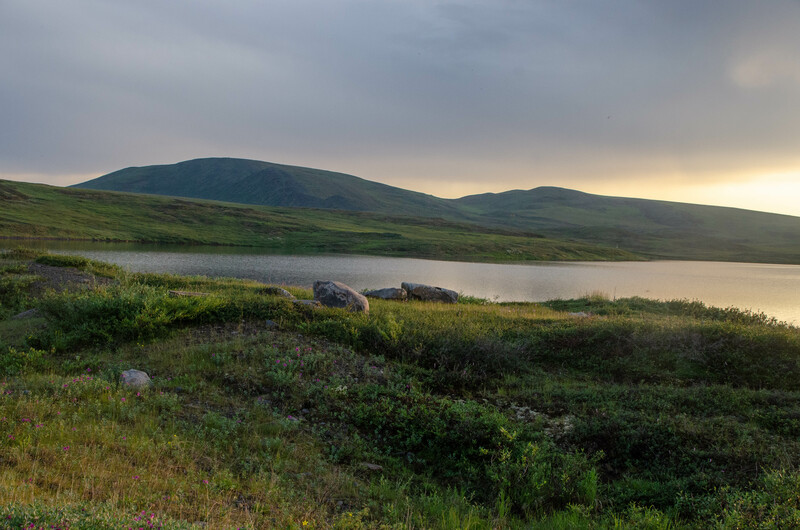 I jumped at the chance to travel to this outpost above the Arctic Circle, on the north side of the Brooks Range. My job will be to develop a lesson plan to share what I learned with my students. I arrived at Toolik Lake Field Station after a 2 hour flight from Anchorage to Prudhoe Bay. I was greeted at the airport by the Toolik Taxi drivers. Two station staff, who’s duties include driving a largely unpaved 130 mile section of the Dalton Highway from Prudhoe Bay to this remote research camp. I had met some of the scientists and teachers I would be working with in Anchorage. It was relatively easy to pick out the science types from the crowd of workers flying into to work in the oil fields. My group included 2 other teachers, and an assortment of researchers and graduate students. We threw our bags in the back of the truck and split up between a passenger van and the truck space for our trek down the haul road. 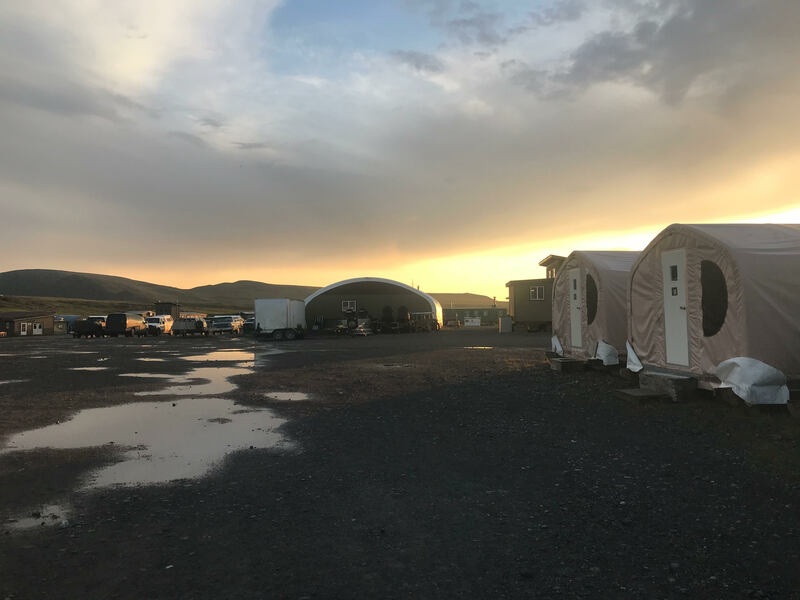 Two Muskoxen, 4 cranes, 4 Northern Harriers, 1 Gryfalcon, several Glaucaus Gulls, 2 ground squirrels and many bumps later brought us into camp. 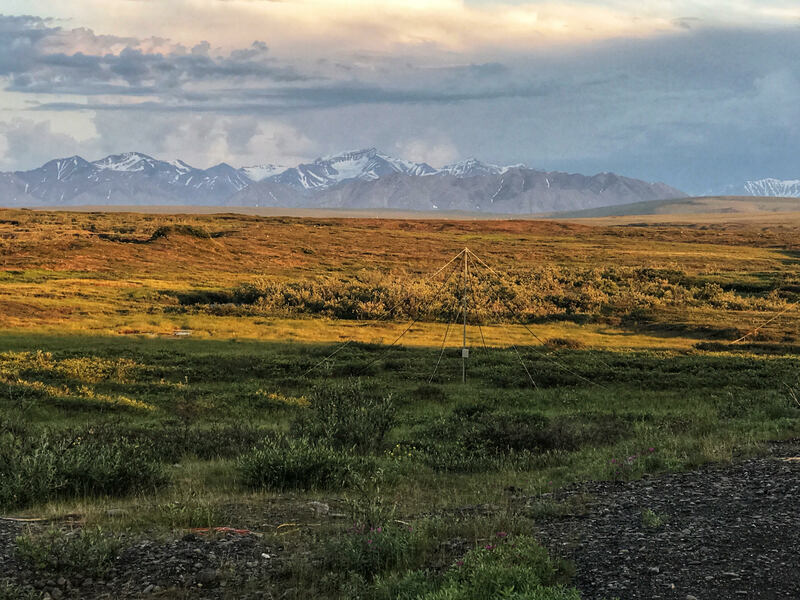 I love the colors and the smells of the Tundra. 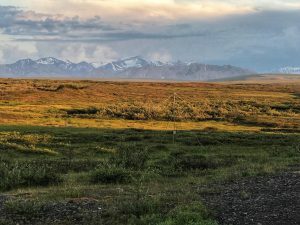 The Brooks Range provides a dramatic background to the somewhat familiar Arctic terrain. The mosquitos are fierce and I look forward to starting our projects tomorrow. The sleeping accommodations have comfortable beds and electricity. Quite luxurious. One of the challenges of teaching science by distance learning is giving students immediate feedback. It’s pretty easy to teach content and vocabulary by distance ed, but teaching thinking skills requires a bit more effort than a multiple choice quiz or a digital worksheet. 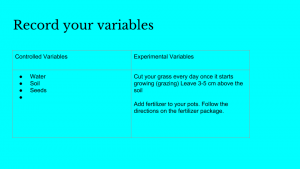 One of my favorite tools is interactive models from PHET and the Concord Consortium, but I struggle with how to make these really deep data analysis activities. I use of Nearpod to walk them through how to use an individual data collection tool. Nearpod gives me a way to control their viewing and get interaction from them to make sure they are on the same page with me. It’s similar to creating a synchronous digital worksheet and getting immediate formative feedback. This is a good way to start. I can tell if the students are listening, participating, and understanding immediately. Nearpod also has self paced options but their is now way for me to leave feedback for students as they work. My goal is to evolve to this next level. I want students to become more independent learners. It’s hard to cut them loose from synchronous and direct teaching. Especially when your are 400 miles away and you can’t look over their shoulders. Last year I attended a conference where I had a chance to hear Alice Keeler speak. Wow, was that good timing. I was so impressed with her energy, and strategies for giving immediate student feedback to students. I made so much sense for my next step. But it was hard to absorb all her tips and tricks at once. 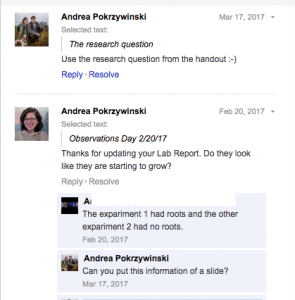 I went back and did a lab with students where I created a Lab Report Template in Google Slides and grouped my students in small groups. It was a mess to get them to learn how to make a copy and share with each other. But we did it and I wondered if maybe I should bite the bullet and use Google Classroom to make the sharing more straight forward. It was really cool to watch my students add data and comment on their progress. I really felt like a coach and I was able to get better quality work from the student. I learned a lot about where they got stuck and I could prompt them to continue with comments and feedback in our live class session. In the past I would assign labs and get frustrated when they would get stuck and not ask questions until the next day when I asked them to turn in their work. So this year, I want to refine my skills at using Google tools. I want to test the waters with adding Google Classroom to my already overflowing toolkit. I felt the need to get some expert advice and have signed up for Alice Keeler’s online class, Next Step with Google Classroom. I was really nervous about diving into Google Classroom. I have always thought that Moodle was my LMS and adding Google Classroom would make things way too cumbersome and confusing. But, now that I am taking a class in Google Classroom and experimenting more, I am becoming convinced that it is the right direction for me. I also found a blog post by Alice Keeler that helped me with the question should I use Moodle or Google classroom? This week I reworked a data assignment that I usually handout in a worksheet and have the students print and turn as a scanned document with screenshot of their graph. I assigned it in Google Classroom and made a copy for each student. This was a dream compared to having them copy my original and struggle with permissions as I had done before. It was also much easier to find their copies and start giving them feedback right away. It probably saved me a good 30 minutes over my old technique. I like the Done, Not done and Returned features. It makes grading very clear for me and my students. It is interesting that all of these features are available in Moodle, but not organized in a way that makes them as visible or easy to use. Commenting on students work is also much more streamlined. Here’s My Assignment if you want to take a peak at it. I also recorded a short screencast of the directions for students who needed to listen to them a second time. This need became obvious as I see 15 students have not completed this activity after ample class work time. I left a comment for all students that this video was now available. I graded everyones assignment on the day we started it and returned assignments to students with their grades and comments. The next day I had 4 requests to regrade. Now I just have to work on the stragglers. But I do feel like I gave them every opportunity to get help and ask a personal question and they chose not to pursue this. It’s a tough topic. I also encouraged them to ask a classmate who had completed the assignment for help, another good, Alice Keeler tip. Our first Ck12.org book has hit the classrooms. This is a huge experiment in using open source text books. 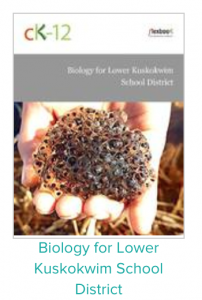 LKSD has implemented our first customized Biology Text district wide. We customized a book using templates and tools made available through Ck12.org and their Flexbook platform. My interest began as I struggled to use commercial books that were loaded with academic language and lengthy chapters filled with thousands of concepts at once. I was searching for books that would be ESL friendly, but still rich in content and rigorous. The Ck12.org books are arranged in concepts vs chapters which present a more digestible chunk of knowledge at one time. We can also edit the book and use our own analogies and local pictures and terms. A team of teachers worked on customizing these books over the summer. Books are available in print and digital format. 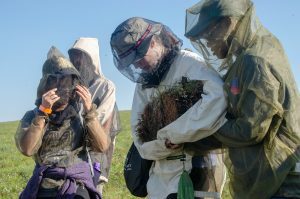 KYUK recently did a news story about our efforts.